Julie and Jim are a young American couple who take a trip to Thailand. The plan is for them to experience the culture together. After some sightseeing in Bangkok, Jim asks Julie to marry him. This is observed by two fellow guests that are staying in the hotel. When they take them out to celebrate the engagement, they are unknowingly tricked into disrespecting a ghost house. This leads to Julie being stricken with a curse that is connected to a malevolent spirit. There is no greater feeling in the world to me than travelling to a foreign country and experiencing that culture. Travelling is one of the most exhilarating and freeing things in the world. To be taken out of your comfort zone, there is nothing quite like it. I can say that I have been on both sides of travelling, the positives and the negatives. So I always find myself gravitating towards these type of movies that show tourists taken out of their usual situations and thrown into the horrors of exploring the unknown. 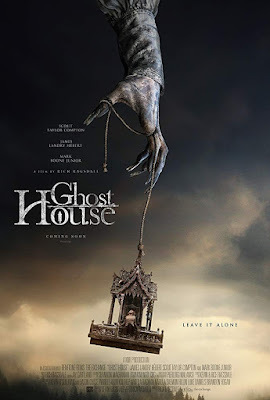 Going into Ghost House, I was expecting something along the lines of The Grudge or The Other Side Of The Door, and the whole J-Horror remake craze. I thought it would riff on that whole 'Tourism Gone Wrong' sub-genre. Ghost House, for the most part, is precisely that. This is a film about an American couple who travel to Thailand and get more than they bargained for. I live for these type of movies, and I have to say that I enjoyed myself more than I didn't with this latest take on a familiar story. While Ghost House has plenty of problems, I wanted to start with the positives of the film. I've never been to Thailand. I have travelled to China and Japan and found both places either very rewarding or spiritual. As I watched this, I felt that the writers and filmmaker tried their best to show Thailand in that light. While still a horror film, and where things go wrong. It only made me want to travel there myself and experience this country for myself. It didn't deter me, as much as it did excite me. I also found myself enjoying the mythology that this story sets up. I pride myself on knowing a lot of the weird and strange stuff that inhabits this world. 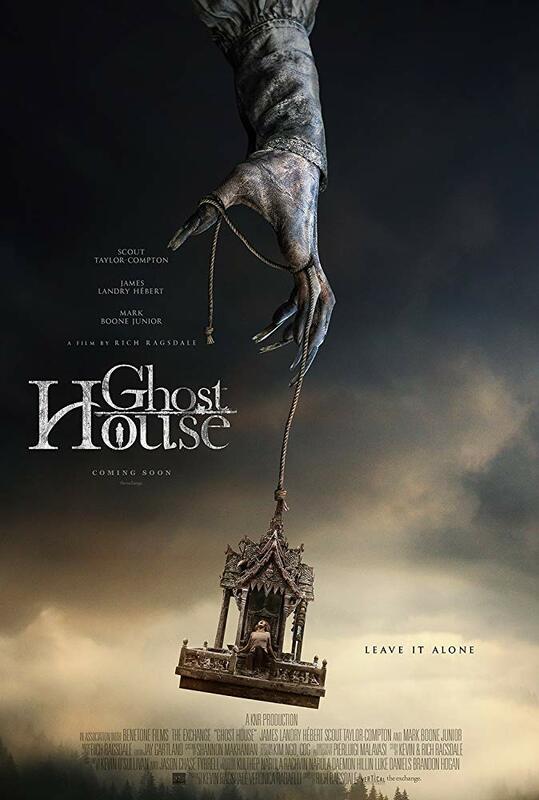 Yet, I had never heard of a ghost house until I saw this movie. In The Grudge, when a person dies in the grip of a powerful rage, that person stains that place of death and seeks to pass on a curse that will eventually kill anyone who comes upon that place. I really loved that about the film. In Ghost House, we have these miniature ghost houses that are created to appease the spirits so they won't move into your house. The movie has this sense of dread looming over it from about fifteen minutes in, and it doesn't really let up until the third act of the film. Once our couple is offered up and is tricked into disrespecting the ghost house, all of the life and colour is drained from this movie. That whole feeling of being lost and alone in a foreign country is felt here. Minus a few nightmarish sequences involving fire, the film stays dark and sombre. It captures the mythology and sense of dread well. When it comes to the actual scares, I don't think the movie was all that scary. It has all the usual jump scares that we've come to expect. Quick flash cuts and the sudden loud noises are littered throughout the film. We've even got that hallway scene where the lights are flickering, just they've not included the ghost in each flicker. It felt very The Grudge 2. A lot of the visuals feel like we've seen them before. I don't think this is going to break any new ground when it comes to the supernatural stuff. Another issue that I have with Ghost House is the third act. I don't know what I was expecting with how they were going to break the curse that Julie is inflicted with, but it wasn't a ritual and sacrifice. It feels different from other films in that sense but also plays incredibly silly. I'm all for witch doctors needing to have someone slice off their own finger as a sacrifice. It's the firey CGI ghost screaming in her demonic voice and scurrying up walls like some cockroach that sort of killed all the tension in that final ritual scene. Not the worst ritual scene I've witnessed in 2017. Lastly, we come to the performances. I've been pretty vocal about my hate-rage for Scout Taylor-Compton's acting in the Halloween films. The more I watch her in other genre films, the more I appreciate her performances. I thought she carried the film. James Landry Herbert who I know from a couple of Micky Keating's movies is decent here. Not as manic and crazy as I've seen him in other films, but here he stars as the sympathetic fiance. The most well known of the cast is Mark Boone Junior, who plays a seedy club owner. He seems to have the most fun with his role. - A ghost shoves her arm down a woman's throat. - A man is seen being repeatedly punched in the face. - We see a road accident involving three deaths. - A woman is seen burning alive. - A man cuts off his own finger. - Visions of a hospital corridor covered in blood. Ghost House isn't without its faults. The movie has a pretty silly third act, and a lot of the scares don't really land. What the story does get right is that it has this sense of hopelessness and being lost in a foreign country. The film looks aesthetically creepy. I think the performances are what really holds this movie together. I wanted to see our couple make it out of this horrible situation alive and that falls back on the chemistry between Scout and James. This is worth a watch. I'm a big fan of Scout Taylor Compton. I'm going to watch this one now.